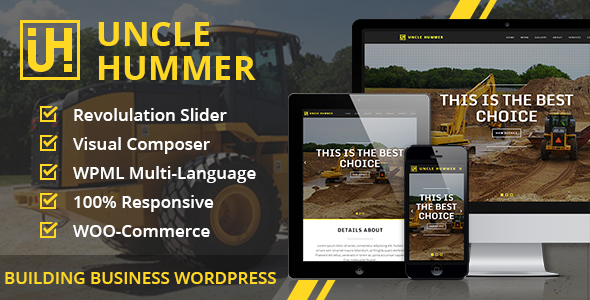 Uncle Hummer – Responsive WordPress Building Theme is Modern and clean type WordPress Theme with great typography. This Theme contains latest features to give your site a trendy look. Uncle-Hummer has been made fully responsive. Great efforts made it possible to give a great user experience to Uncle-Hummer with HTML5, CSS3, less, Visual composer page builder, Revolution Slider.It is easy to customize and enables you to create lots of positions for short-codes and plugins.Integrated shortcodes might reduce your time in typing codes. Google fonts and hundreds of icons can be added dynamically and by using shortcodes. Uncle-Hummer is utilize for business, portfolio, product, Ship builders, Contraction, Building corporate and website. 15th February, 2015, Version 2.1.1: Updated Woo-Commerce version, Updated plugins and fixed bugs. 13th January 2015, Version 2.0.0: Updated WordPress version 4.1 & Fixed bugs.